I woke up this morning before Ethan -- a feat, really -- trying to assess how I was feeling. It can be frustrating when your child's name and memory is met with sadness, although understandable. Death is sad always. Death of a child is sadder yet. Wylie's circumstances were sad, of course. Here was this much loved, much wanted baby who quite literally had a broken heart inside of her chest and somehow death and birth came entwined. As time goes on, I have wanted Wylie's name and memory to be synonymous with happiness. I have wanted her love and legacy to somehow go on to bring smiles or touch lives somehow, someway. It isn't so cut and dry. I will miss my daughter with every shred of my being until the day I, too, am gone. Truth be told, I had been planning Wylie's birthday party since the moment we had her name picked out. I do that, plan parties (if you haven't noticed). Wylie And The Purple Crayon was the theme of the party that I never got to throw; the decorations I began sitting in the drawers of her closet underneath the racks of clothes she would never wear. And, yes, it's sad, all of it. It's heartbreaking, every bit of it. 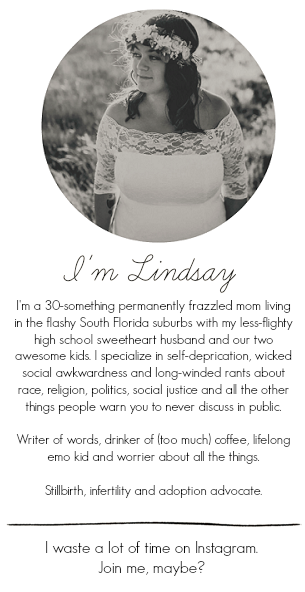 I shocked myself when I woke up feeling slightly numb, a little peaceful, a tiny bit anxious. I took myself to Target early on and sat in the parking lot sobbing nonsensically at Alkaline Trio's I Remember A Rooftop which held no secret meaning, it was simply a release. Our daughter's name was mentioned often by friends today. A few friends paid it forward for Wylie throughout the day, some even bringing donations to the humane society in Wylie's name. Another friend put a birthday girl button at Wylie's tree. Her name was spoken often today and, for the most part, I think it was in joy. Of course, there is still sadness. How can there not be? How can there not be sadness in tragedy? I knew that Wylie And The Purple Crayon couldn't happen now. It felt wrong. I also knew I wanted to celebrate her in some way more subdued and so my friend made us a cake and I posted an open invitation on Facebook to meet up with our family to have some. Recently, Wylie's tree had bloomed for the first time and though the branches were still too small for shade -- and the day was hot, believe me -- it was perfect still. So many friends surprised us by stopping by to share in Wylie's memory and to talk, laugh, be with us to bring a little of the joy that I sought out back. In light of the massive loss and inevitable devastation of today, we were gifted comfort by those who came to remember Wylie with us. 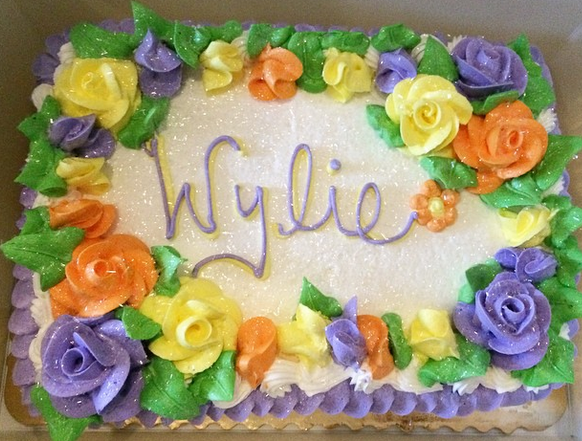 (Thank you, to anyone reading this, who came to have cake and celebrate Wylie with us. It means more than you know!) The afternoon brought peace and a little bit of calm to the storm that has been rolling in my stomach since this day last year when we said hello and goodbye to our beautiful little girl. I think it went well, her little party. At first I didn't want to call it a party, but then once it happened, I did. Four hours ago now, a beautiful little girl was born. Through the pain of labor, everything seemed a blur. As I screamed and pushed, I remember focusing on the deep, black tattoos on the arms of the nurse who held my hands and leaned in to me lovingly, sadly, knowingly. The dark contrast of the ink seemed like the only thing my eyes could see through the pain. And then you were born, only there were no cries like the ones your big brother had let out into the world. There was the silence of the night and the reverberation of my screams which broke the silence for you. I can still see the love in my doctor's eyes as she met my gaze and told me what I already knew: that you were perfect. That you were beautiful. Your father and I took turns holding you as you slept. I regret not taking a lock of your dark, black curls but the coarseness of your hair is etched in my memory and lives each day atop your father's head. His hair. You had his hair. You slept and we held you and told you we loved you even though you could not hear us and even though I knew, confidently knew, that you knew firsthand our love. The outside world is flawed, but inside of me you knew only warmth and love and happiness (and Captain Crunch cereal, your favorite). It's not unlike your own body. Outside, you were perfect. Inside, your heart was broken. There is a frustration that arises when things seem simultaneously so right and so wrong and so I, as your mother, choose to remember you as only perfect. How perfect you looked wrapped up in the baby blanket your grandmother crocheted for you. How perfect you looked tucked inside the layette gown that your brother wore on his first night home from the hospital. I have believed since the moment I became a mother that it is my job as a mother to exist to honor my children. I will never stop honoring you. I will never stop remembering you. I will never stop prioritizing you despite the resistance from a world that would rather I not. In my days, I often hear "haven't you moved on yet?" or "aren't you over your loss yet?" and I am back to that place of holding you in my arms, kissing your forehead as my tears fall onto your cheeks and I realize then that the problem isn't with me. You aren't "a loss," my sweet girl, my child. Your tiny fingers never gripped mine as I turned your hands over in my palms. Your eyes never opened to look longingly at me. You never cried or breathed or saw the world that wishes you were swept under the rug but I promise, I promise, I will honor you until I am no longer here myself. On this day one year ago, I held you with the love and intensity of a mother and cried as your father lifted you up to study your perfect, tiny face. "It's like looking in a mirror," my grandmother used to say whenever my sister walked into a room. For him, I know, looking at you was like looking in a mirror. One year ago, I handed you over to the funeral home, bundled and swaddled, and felt broken as they took you from me. That brokenness will never really go away. My arms will always ache for you and, my darling, what could have been. Who you could have been. Even so, you have changed the world more than you know. One year ago, I learned you do love your second baby as much as your first and that the love between mother and child is never broken. It doesn't die with the physical body of either. It transcends all else and always will. Happy birthday to my beautiful baby girl, Wylie Meadow. My woman king. Born still but still born. Thank you for sharing your story. My Tamara LaRie would have been 25 years old on May 7th. I remember her as perfect though she had multiple medical problems.It seemed like yesterday that I held her in my arms, sang to her, and felt her spirit leave her body. My precious daughter, my second born child, born, but never lived to see her potential. I honor her and your Wylie and all the other precious children who live only in our memories.